The Christian Center is under remodeling for the next 18 months. Photo by Adria Walker. This summer, with help from big alumni donations, Millsaps began an 18-month remodeling project on the Christian Center. The Christian Center, often referred to as the CC, was the longtime home of the departments of religious studies, history and theater—as well as home to Millsaps’ only theater with a stage and full technical setup. Millsaps’ Christian Center is the farthest South academic building on campus. The brick building reflects the time in which it was built—the front of the building faces Midtown (it and John Stone Hall, are the only remaining buildings on campus to do so), the low-income neighborhood on which Millsaps physically turned its back. Built in 1950 the Christian Center’s original purpose was to honor Millsaps students and graduates who died fighting in World War II. A bronze plaque in the foyer of the building serves as a tribute to the fallen. As most students no longer use the front entrance—it is—or was, until it was closed off to students for remodeling–quicker and more convenient to travel through the side doors of the building—and the foyer is dimly lit, very few see, much less read, this tribute. The Board of Trustees approved a $19.2 million contract with W.G. Yates and Sons Construction Co., to renovate the Christian Center and to construct a new Visual Arts Center and West Gate entrance to campus. The Christian Center will be renamed “the Selby and Richard McRae Christian Center” after some of the project’s most generous donors. The Christian Center remodel is a long time coming. James Bowley, professor and chair of religious studies, has been at Millsaps for 15 years. During his time at the college, his office has always been in the Christian Center. “The Christian Center is a very old and historic building that has supposed to have been replaced since I came (in fall of 2002) and, from what I understand, before that as well,” Bowley said. Bowley recalls three times he was told that there were plans to demolish the building. However, those plans never came to fruition, and Bowley, like other professors, stopped taking them seriously. Still, he believes that the humanities deserve a more up-to-date building. Keith Dunn, senior vice president for academic affairs and dean of the college, who has been at Millsaps for six years, agrees. “The clear message from our students and our faculty and staff is that the humanities deserves a facility that is state of the art and sends a message that humanities are at the heart of the liberal arts education experience, and we don’t have that right now,” he told the Purple and White in May. Both the current and previous college administration have planned to change the building. 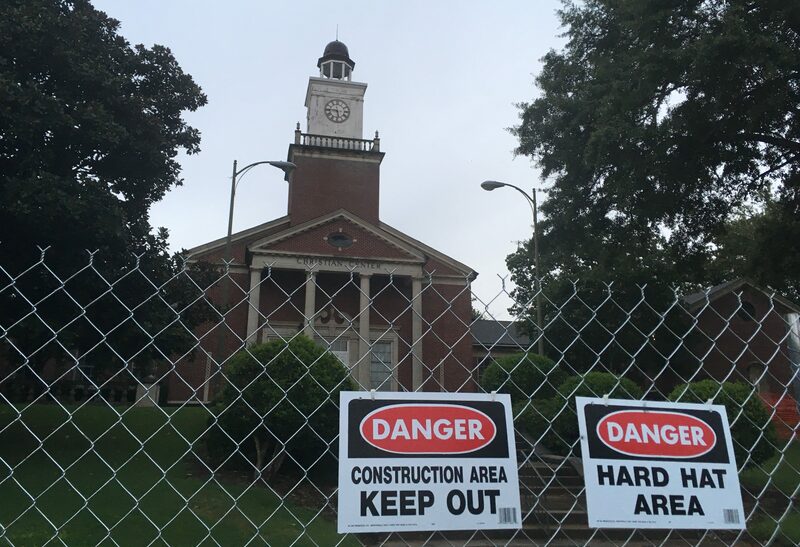 Dunn said the college’s campus master plan that immediately predates his arrival six years ago says that parts of the Christian Center are structurally unstable and unsafe to inhabit. However, the administration was unable to find engineers’ reports (The Purple & White has requested these documents and will update this story when we receive them), that corroborated that statement. Dunn says there were reports for a few potentially hazardous places in the theatre, such as the catwalk behind the stage, areas where the stage counterweighting was unsafe, and reports from structural engineers about the foundation. However, many of the repairs that previous engineers had recommended had already been done and that the remaining ones could be done, Dunn says. Bob Adams, the architect who ran the project to make the James Observatory into a historic landmark, helped the administration create plans to renovate the Christian Center building while maintaining the exterior. Initially, Dunn says, the administration considered bulldozing the building and creating a completely different academic building. However, Dr. Stan Galicki, in the geology department, submitted a document saying that, though the building was built on Yazoo clay, it would be possible and, in fact, less expensive to restore the building. “(Galiciki’s suggestion) was sort of a tipping point as we explored, we reengaged some engineering firms, and Yates construction was again instrumental in helping us understand the scope of what it would take to restore the building rather than to raze it and build a new one,” Dunn said. Faculty were heavily involved with design plans. Ultimately, administrators and faculty members decided that the Christian Center’s interior would be designed similarly to Sullivan Harrell—where each department has an area of its own that includes a common space and offices—with an interfaith chapel replacing the theater. Not everyone was on board with gutting the theater, however, and Dunn said there was extended discussion about whether or not to replace it. “That was not a unanimous decision by any stretch of the imagination, but faculty were part of those conversations as we went forward,” Dunn said. Though the Christian Center was initially created and erected with the enthusiasm and help of then-students (and with large contributions from the United Methodist Church, old Purple & White reporting shows) as a tribute to students who served in World War II, current Millsaps students have largely been left out of the plans for remodeling the building. Rather, the remodel is mostly driven by alumni donors who are interested in preserving their Millsaps memories, by preserving the building’s exterior look and feel. Bowley says that current students were not, to his knowledge, consulted at all about the Christian Center. Differences between the goals of donors who are funding the remodeling of the Christian Center and of some members of the current students and faculty are seen in disputes about the name of the Christian Center itself. Dunn says that several members of the faculty who work in the Christian Center wrote a letter to him and President Rob Pearigen asking them to consider the possibility of renaming the building. “Many faculty are concerned about an academic building being centered around a worship space. Being concerned about the integrity of the intellectual and academic program, that also applies to the name of the building. What message does it send to say (the humanities are) all in the Christian Center building?” Bowley said. Still, the people who are bankrolling the remodel have decided to retain the name, while centering the building around an interfaith-Chapel. In March of this year, the Selby and Richard McRae Foundation gave Millsaps $4 million towards the renovation of the Christian Center, on top of a February 2016 donation of $1.5 million by the same foundation.